This image of a generic original protocell is from a NASA site: www.nas.nasa.gov/Main/Features/2000/Spring/Astro_protocells_image.html. Following the accompanying definition, “protocells” presage the formation of cellular life. 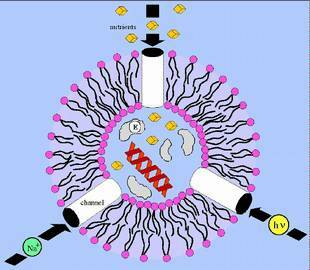 This image depicts its basic functions; yellow represents the capture and utilization of environmental energy, blue represents the transport of nutrients, and green represents the transport of ions. Emergence in Chemical Systems 2.0. www.math.uaa.alaska.edu/~afkjm/chemicalemergence/index.php. An announcement for a conference to be held at the University of Alaska Anchorage, June 22-26, 2009 to consider the growing sense of a fertile natural materiality whose innate propensities develop into intricate and intelligent life. Leading researchers such as Robert Hazen, David Deamer, Jennifer Dunne, Steen Rasmussen, and others are confirmed speakers. The second quote for a Chemical Complexity section makes an engaging analogy with grammatical language. Systems Chemistry. www.esf.org/conferences/08267. An October 2008 meeting held at Maratea, Italy by the European Science Foundation as part of its Action CM0703: Systems Chemistry initiative. Noted more in the SC section, many signs are noted of life’s origins rooting into an organic nature. Adami, Christoph. Information-Theoretic Considerations Concerning the Origin of Life. arXiv:1409.0590. The Michigan State University scientist makes an important point that in addition to the usual metabolic and/or replicative aspects, the presence of innate autocatalytic programs ought to be factored in for a complete scenario. Adami, Christoph and Thomas LaBar. From Entropy to Information: Biased Typewriters and the Origin of Life. arXiv:1506.06988. A chapter in From Matter to Life: Information and Causality, edited by Sara Walker, Paul Davies and George Ellis, from Cambridge University Press in late 2015. The posting updates Adami’s 2014 paper at arXiv:1409.0590 (search) about the necessity and presence beyond metabolic components of a prescriptive source driving the occasion of early organisms. But as many entries, a tacit conflation persists about greater nature. While it is proposed that an inherent exigency toward complex life seems to exist, per the second quote, this still occurs “by chance.” In our revolutionary moment, many authors remain on the fence often mixing both sides. While “information” is seen as “the defining characteristic of life,” this quality may yet occur by statistical excesses. Allwood, Abigail. Evidence of Life in Earth’s Oldest Rocks. Nature. 537/500, 2016. A commentary by an JPL CalTech astrobiologist on Rapid Emergence of Life Shown by Discovery of 3,700 Million Year Old Microbial Structures by Allen Nutman, et al in the same issue (537/535). Ancient rocky Greenland strata were found to have microbial fossils even in this earliest period not long after Earth’s calculated formation about 4 billion years ago. The inference is that given any minimum milieu, organic semblances will readily occur. Give life half an opportunity and it’ll will run with it. Ashkenasy, Gonen, et al. Emergence of Animate Behavior in Peptide-Based Ecosystems. Astrobiology. 2/4, 2003. A conference abstract notes the deep propensity of nature to give rise to increasingly complex, evolving organic systems and societies. Bada, Jeffery. How Life Began on Earth: A Status Report. Earth and Planetary Science Letters. 226/1-2, 2004. Two complementary views are joined to explain the transition from abiotic compounds to autonomous self-replicating molecules. The prebiotic soup theory proposes organic chemicals in primordial seas which underwent polymerization to produce increasingly complex macromolecules. The metabolist version brings in the impetus of autocatalytic self-sustaining reactions which foster this evolution to form information-bearing polynucleotides. In so doing, life arises from an initial RNA chemistry to its DNA/protein biochemistry phase and on to cells and organisms. Barge, Laura, et al. Thermodynamics, Disequilibrium, Evolution: Far from Equilibrium Geological and Chemical Considerations for Origin of Life Research. Origins of Life and Evolution of Biospheres. Online June, 2016. A 14 person team with several members from the Chemical Gardens group such as Julyan Cartwright and Michael Russell (search Barge) report on this NASA Astrobiology Institute conference, as the Abstract notes. Whereas other efforts may study biomolecular and environmental aspects, here nature’s energies which drive life’s evolutionary emergence are given their essential due. See also Leroy Cronin 2016 for another endeavor to also include intrinsic network dynamics. Baum, David and Niles Lehman. Life’s Late Digital Revolution and Why It Matters for the Study of the Origins of Life. Life. 7/3, 2017. University of Wisconsin and Portland State University biochemists make a good case for dual computational phases in effect as they inform and propel organic evolution. Notably it is said that “life began in an analog mode” (akin our initial right brain?) from which a later digital mode could arise. An integral analog cast leads to an autocatalysis of to novel cellular forms, to be later facilitated by digital components. As a final result, a whole genome system can be better specified. Bedau, Mark and Emily Parke, eds. The Ethics of Protocells. Cambridge: MIT Press, 2009. A companion volume to Protocells: Bridging Nonliving and Living Matter whose chapters consider “Moral and Social Implications of Creating Life in the Laboratory” in an effort to get in front of, or in step with, where such probable advances, which will occur for this very reason, might take us. But without a conducive cosmology to guide why human beings should now be invited and empowered to take over, continue, and enhance animate creation, indeed to “play God,” many fraught issue persist. Benner, Steven, et al. Setting the Stage: The History, Chemistry, and Geobiology behind RNA. Atkins, John, et al, eds. RNA Worlds: From Life’s Origins to Diversity in Gene Regulation. Cold Spring Harbor: CSH Laboratory Press, 2011. Foundation for Applied Molecular Evolution, Gainesville, FL, biochemists introduce this collection about new respect for and understanding of this ribonucleic acid macromolecule so crucial to life. Four approaches are enlisted: “paleogenetics” the gaining of inferences about past life from present structures; “prebiotic chemistry” via studies of organic and inorganic species thought to populate the early earth; “exploration” with hopes to find extraterrestrial biosamples; and “synthetic biology” experiments to create new bioversions. We quote a synopsis for the edition. Once thought to be just a messenger that allows genetic information encoded in DNA to direct the formation of proteins, RNA (ribonucleic acid) is now known to be a highly versatile molecule that has multiple roles in cells. It can function as an enzyme, scaffold various subcellular structures, and regulate gene expression through a variety of mechanisms, as well as act as a key component of the protein synthesis and splicing machinery. Perhaps most interestingly, increasing evidence indicates that RNA preceded DNA as the hereditary material and played a crucial role in the early evolution of life on Earth. This volume reviews our understanding of two RNA worlds: the primordial RNA world before DNA, in which RNA was both information store and biocatalyst; and the contemporary RNA world, in which mRNA, tRNA, rRNA, siRNA, miRNA, and a host of other RNAs operate.